Objectives: To evaluate and compare the diagnostic value of computer-assisted caries detector Logicon with other diagnostic methods. Materials and Methods: This study was conducted on 300 proximal surfaces corresponding to 150 posterior teeth. The diagnostic techniques employed comprised an ORIx 65 kV intraoral radiodiagnostic apparatus, Trophy RVG system in normal mode, and in combination with a caries diagnosis assisting program by Logicon. The same X-ray source was used for the entire study, followed by comparison with histological sections of the teeth used which were observed under light microscope. The positive and negative predictive values, sensitivity, specificity, and probability ratio were calculated. Results: Application of computer-assisted caries detector Logicon increased sensitivity for the cases where caries was extending into the dentin. In contrast, conventional radiography showed a higher specificity and positive predictive value, whereas the negative predictive values were the same for both techniques. Conclusion: This study has demonstrated that Logicon Caries Detector can enable dentists to find 49% more cases of caries penetrating the dentin than they were able to find without it. In 1895, German physicist Wilhelm Conrad Roentgen discovered the X-ray. Two weeks after Roentgen made his discovery public, the first dental radiograph was made by German dentist Otto Walkoff. Intraoral radiography has made a significant contribution as a diagnostic aid in the detection of carious lesions. The primary diagnostic tool for the evaluation of the proximal caries in posterior teeth being bitewing radiographs. 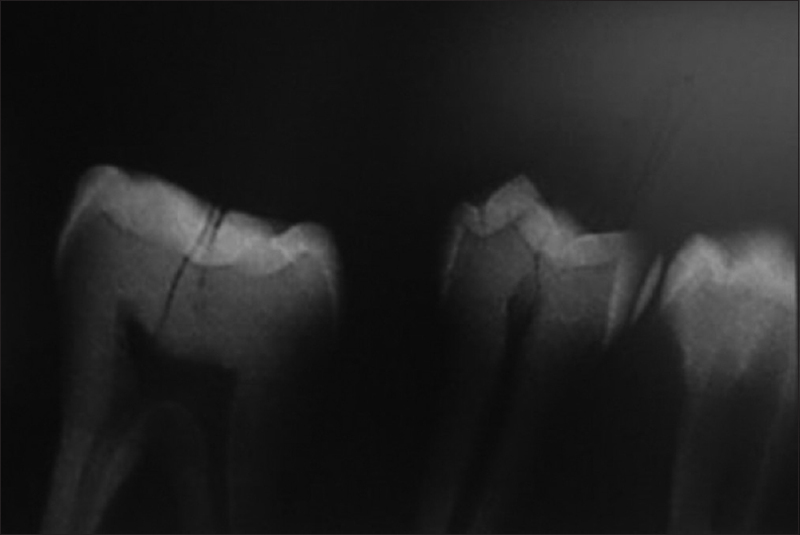 Conventional radiographs have limitations and are unable to reveal the early stages of dental caries, and also underestimate the extent of caries, which is important for developing a treatment plan., Further, radiographs have a risk of false-positive and false-negative diagnosis with smaller lesions in addition to interobserver variations in the interpretation of the same image. 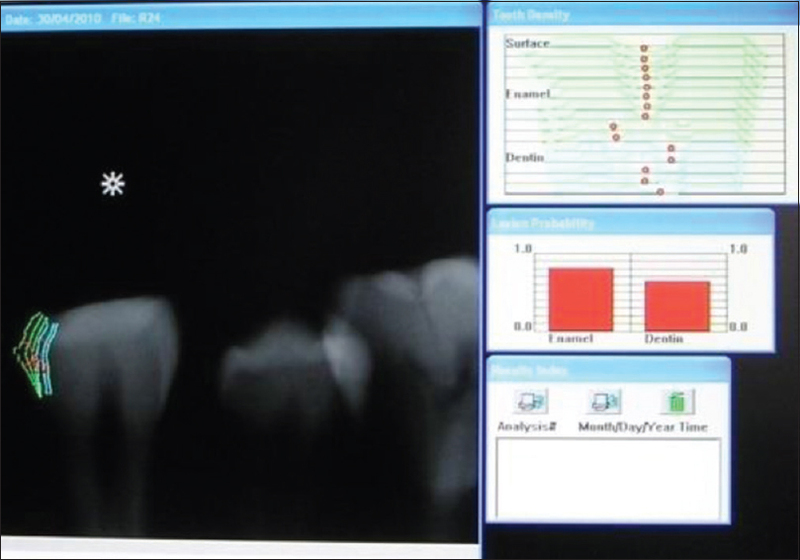 With the advent of digital radiography and development of software, the diagnosis of early proximal caries has improved., Logicon developed a unique software tool, which can assist in diagnosing proximal caries. 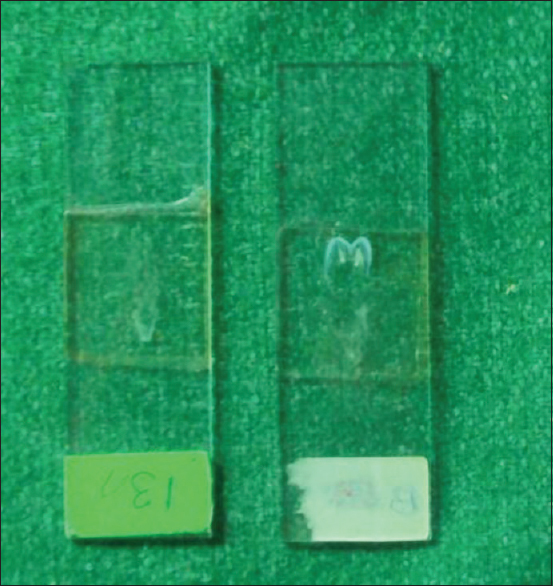 Thus, this study was carried out to evaluate the efficacy of Logicon software by comparing the results with histological findings. The aim of the present study was to compare the diagnostic accuracy of conventional film and Radio Visio Graphy (RVG) with Logicon in early proximal caries. This study was conducted on 150 extracted teeth with or without carious lesions having intact crown. Teeth with dental fractures, developmental anomalies causing morphological and/or structural alterations, consumptive processes, teeth with extensive carious lesion, or canal invasion with severe coronal morphological and structural alterations were excluded. For the radiographic study, the teeth were mounted in groups of 8 teeth, 4 maxillary and 4 mandibular, of which 2 each were premolars and molars. Total 19 set of 8 teeth were used in which 2 teeth were added in the last group to achieve articulation. Articulation of the two blocks of teeth was achieved to reproduce the anatomical relations among the neighboring and opposing teeth. Once articulated, the teeth were kept stable on a support with the occlusal plane parallel to the floor and the long axis of the tooth perpendicular to this plane. The focal spot-to-object distance, the object-to-image receptor distance, and the horizontal and vertical angulation of the X-ray beam were kept constant to standardize the entire procedure. An ORIx 65 kV intraoral radiographic machine was used with Kodak Intraoral E-Speed Film. The selected exposure time was 0.5 s. Processing of the film was performed with a Photon developer (RPPhotographic, India). Interpretation was carried out under conditions of environmental illumination, without opacification or magnification. Digital recording of the same models was done using Trophy RVG system with an exposure time of 0.1 s [Figure 1]. Once digitally recorded, the images were analyzed using Logicon [Figure 2]. For histopathological examination, the teeth were sectioned and observed under a microscope [Figure 3]. The proximal caries observed with both conventional radiography and standard RVG were classified according to the following criteria: 0 = no radiolucency or visible restoration; 1 = enhanced radiolucency zone in the external half of the enamel; 2 = radiolucency zone occupying the full thickness of the enamel, though without reaching the dentinoenamel junction; 3 = increased radiolucency involving the enamel, dentinoenamel junction and external half of the dentine; and 4 = increased radiolucency penetrating to the internal half of the dentine, either with or without apparent involvement of the pulp. The histopathological diagnostic criteria were: 0 = no evidence of caries, 1 = presence of a carious lesion (or lesions) in the external half of the enamel only; 2 = presence of a carious lesion (or lesions) in the inner half of the enamel, including the dentinoenamel junction but without spread to the dentine; 3 = presence of a carious lesion (or lesions) through the enamel to the external half of the dentine; and 4 = presence of a carious lesion (or lesions) through the enamel to the inner half of the dentine. Three observers, two from Al Badar Dental College and one from Bengaluru, volunteered to participate in the study. All were general practitioners and had experience with computers, as well as with the digital radiography system used in the study (Trophy RVG). To analyze the results, measurements were made of the corresponding sensitivity, specificity, positive and negative predictive values (PPV and NPV), and likelihood ratio. For intraobserver validation, percentage concordance and Cohen kappa test were performed. Data analysis revealed that, among the 300 surfaces observed, bitewing radiographs detected 12 carious lesion, 6 surfaces showed caries involving external half of the enamel, 3 surfaces showed carious lesion in the outer and inner enamel without involving the dentinoenamel junction, and 3 surfaces showed deep carious lesion involving the dentinoenamel junction [Table 1]. RVG showed caries in 23 mesial surfaces, of which 15 were in the outer enamel, 4 were in the inner enamel, and other 4 were involving the dentinoenamel junction and the external half of the dentin; whereas among the distal surfaces, it showed caries in 20 surfaces among which 15 were in the outer enamel and 5 involved the dentinoenamel junction and the external half of the dentin, and did not show any caries in the inner enamel. On the other hand, RVG supported by Logicon software showed 84 carious lesions among that 30 mesial surfaces showed carious lesion in the outer half of the enamel, whereas distal surface showed 9 lesions involving outer enamel. However, 18 surfaces showed lesion involving the inner half of the enamel, and 3 lesions on the mesial surface and 6 lesions on the distal surface showed involvement of the dentinoenamel junction. Histopathological examination revealed 84 carious lesions among the 300 surfaces observed, among which 33 mesial surfaces and 27 distal surfaces showed caries in the outer enamel, 9 mesial, and 12 distal surfaces showed carious lesion in the inner enamel without involving the dentinoenamel junction, and 3 lesions were seen involving the dentinoenamel junction. As suggested by the data analysis afforded by both conventional bitewing and RVG tests [Table 2] and [Table 3], intraobserver reliability was found to be very high, as shown by the kappa test; the values were 0.98% for bitewing and 0.96% for RVG. Comparison of the sensitivity among bitewing, RVG, and logicon with standard histopathological findings showed the highest sensitivity by the RVG assisted with Logicon program on the mesial as well as distal surfaces [Table 4]. In contrast, the highest specificity was afforded by conventional radiograph for all surfaces studied. In the case of PPV, the best results were obtained with conventional radiography, whereas NPV showed similar values among all the diagnostic modalities and for all the surfaces. This indicates that positive readings with these explorations do not increase the probability of caries affecting the surfaces studied [Table 5]. Results showed that bitewing detects 14%, RVG 50.6%, whereas logicon showed 99.05% of proximal caries considering histopathologic examination as the standard. Logicon caries detector is designed to extract the maximum information from the shades of gray in digital radiographic images to correlate them with a database of known caries disease features and to display the information in a format that helps the dentist make a treatment decision. Data analysis revealed that digital radiography detects 70% of deep dentinal lesions, whereas other imaging techniques detected only 45%. These results are similar to the study carried out by Navarro et al., which showed that digital radiography detects 70% of deep dentinal lesions, and other radiographic technique showed only 45%, which was also seen in our study. Another study reported by Syriopoulos, Sanderink, Velders, and van der Stelt concluded that there are no differences in diagnostic accuracy using Ektaspeed Plus or Dentus M2 dental films; a similar study was done by Wenzel that concluded that the digital receptors studied possessed a diagnostic accuracy similar to film. Another study done by Castro et al. concluded that no significant difference was found between the diagnostic accuracies of the three imaging modalities in the detection of proximal caries. However, the study done by Wenzel compared conventional bitewings and digitized films and found that the latter recorded a somewhat lower percentage of caries. Another study reported by Castro et al. concluded that the conventional film had a slightly higher level of diagnostic accuracy than the unenhanced direct digital and inversion grayscale direct digital imaging in the detection of proximal caries. In our study, higher sensitivity values were obtained for RVG assisted with Logicon which showed 34% on the mesial surfaces and 22% on distal surfaces, compared with the standard RVG technique which showed 15% on the mesial and 14% on the distal surfaces, whereas conventional bitewing showed slighter inferior sensitivity with 4% on mesial and 4% on distal surfaces, which is similar to the study reported by Navarro et al. in which Logicon showed 30% on mesial and 29% on distal surfaces indicating that RVG-assisted with Logicon showed the highest sensitivity compared to other diagnostic procedure, our study also showed higher sensitivity to Logicon. Another study reported by Wenzel concluded that sensitivity increased using the digitized film images compared with film radiographs, similar results were observed in our study. Studies reported by Russell and Pitts concluded that RVG have a lower sensitivity in vitro for the detection of proximal carious lesions than conventional bitewing radiographs; however, they have a slightly higher sensitivity than the conventional method for the diagnosis of occlusal caries. In our study, the highest specificity was seen with conventional bitewing which showed 96% on mesial and distal surfaces, least specificity was seen with RVG assisted with Logicon which showed 66% on mesial and 78% on the distal surface, which is similar to the study reported by Navarro et al., wherein the highest specificity was provided by conventional bitewing which was 99% on the mesial and 94% on the distal surfaces and least specificity was seen with RVG assisted with Logicon which showed 75% on mesial and 70% on distal surfaces. In the case of PPV, the best results were obtained with conventional radiography which showed PPV of approximately 80% on the mesial and 42% on the distal surfaces, which is similar to the findings reported by Navarro et al., which showed PPV of approximately 90% on the mesial and 35% on the distal surfaces. NPV was the highest for RVG on the mesial surface, which was 83% and the lowest value was for conventional bitewing showing a value of 78%. For the distal surface, the highest NPV was for bitewing and RVG assisted with Logicon (81%), and the lowest NPV was 78% for RVG, which is similar to the study reported by Navarro et al. The likelihood ratios ranged from 1 to 2, reflecting the different increments in the probability that a given carious tooth will yield a positive reading with the corresponding diagnostic technique. As suggested by the data analysis afforded by both tests, percentage concordance was 96% for both mesial and distal surfaces for bitewing, whereas it was 85% on the mesial and 87% on the distal surfaces, as shown by the RVG and kappa test, which was 0.98 for bitewing, 0.96 for RVG, and 0.94 for Logicon. Intraobserver reliability was found to be very high, thus contributing to ensure consistency of the results obtained. In the present study, a single X-ray source was used with known and stable characteristics, and exposure was controlled for time, focal distance, and position. The film and digital detector features likewise remained constant throughout the study. The digital images obtained were equalized under constant parameters to ensure the best possible image under known and normalized conditions. In the case of the radiographs, we conducted visualization, as uniformly and simply as possible. The advent of digital radiography has provided an opportunity to develop smart image analysis tools to assist the dentist in evaluating radiographs. This study has demonstrated that Logicon caries detector can enable dentists to find 49% more cases of caries penetrating the dentin than they were able to find without it. The results obtained suggest digital radiology to be effective in the diagnosis of dental caries. The advances in digital radiography and software have definitely enhanced the ability of practitioners in the diagnosis of proximal caries, however, with further refinement in the software to increase specificity will further enhance the diagnostic accuracy. Van der Stelt PF. Filmless imaging: The uses of digital radiography in dental practice. J Am Dent Assoc 2005;136:1379-87. Castro VM, Katz JO, Hardman PK, Glaros AG, Spencer P. In vitro comparison of conventional film and direct digital imaging in the detection of approximal caries. Dentomaxillofac Radiol 2007;36:138-42. Heaven T, Firestone A, Feagin F. Quantitative radiographic measurement of dentinal lesions. J Dent Res 1990;69:51-4. Gakenheimer DC. The efficacy of a computerized caries detector in intraoral digital radiography. J Am Dent Assoc 2002;133:883-90. Van der Stelt PF. Better Imaging: The advantages of digital radiography. J Am Dent Assoc 2008;139:7S-13S. Wenzel A. Digital radiography and caries diagnosis. Dentomaxillofac Radiol 1998;27:3-11. Navarro LP, Puy MC, Godoy FG. Diagnostic performance of radiovisiography in combination with a diagnosis assisting program versus conventional radiography and radiovisiography in basic mode and with magnification. Med Oral Patol Oral Cir Bucal 2008;13:E261-5. Syriopoulos K, Sanderink GC, Velders XL, van der Stelt PF. Radiographic detection of approximal caries: A comparison of dental films and digital imaging systems. Dentomaxillofac Radiol 2000;29:312-8. Wenzel A. A review of dentists' use of digital radiography and caries diagnosis with digital systems. Dentomaxillofac Radiol 2006;35:307-14. Russell M, Pitts NB. Radiovisiography diagnosis of dental caries: Initial comparision of basic mode videoprints with bitewing radiography. Caries Res 1993;27:65-70. Mileman PA, van den Hout WB, Sanderink GC. Randomized controlled trial of a computer-assisted learning program to improve caries detection from bitewing radiographs. Dentomaxillofac Radiol 2003;32:116-23. Duncan RC, Heaven T, Weems RA, Firestone AR, Greer DF, Patel JR. Using computers to diagnose and plan treatment of approximal caries. Detected in radiographs J Am Dent Assoc. 1995;126:873-82. Nigel B, Pitts. Detection and measurement of approximal radiolucencies by computer-aided image analysis. Oral Surg 1984;58:358-66. Eickholz P, Kolb I, Lenhard M, Hassfeld S, Staehle HJ. Digital radiography of interproximal caries. Effect of different filters. Caries Res 1999;33:234-41. Mouyen F, Benz C, Sonnabend E, Lodter JP. Presentation and physical evaluation of RadioVisioGraphy. Oral Surg Oral Med Oral Pathol 1989;68:238-42. White SC, Yoon DC. Comparative performance of digital and conventional images for detecting proximal surface caries. Dentomaxillofacial Radiol 1997;26:32-8.